The innovators of Russia’s first exoskeleton, designed to enhance the physical abilities of the human body, have been welcomed into the Skolkovo fold after triumphing at the organization’s Startup Village event earlier this year. The decision to grant participant status to ExoAtlet, a company formed from a group of robotics students at Moscow State University, was taken this week after representatives “defended” the project to a Skolkovo Foundation expert council. “Skolkovo seems to us to be a very organic forum to conduct our activities,” said Ekaterina Bereziy, the company’s founder and CEO. Startups under Skolkovo’s wing become a part of the organization’s ecosystem, benefitting from tax breaks, advice and administrative support as well as the right to apply for grants, which are co-financed by investors and help get ideas off the drawing board and into production. ExoAtlet joins Skolkovo’s IT cluster, home to more than 300 companies from around the country and partnered by multinational giants such as Cisco Systems, IBM, Microsoft, Intel, Nokia, Ericsson and others. “Thanks to communication and consultations with experts from Skolkovo’s IT cluster, and specifically with [director of IT projects] Albert Yefimov, we have managed to structure the information about our project, highlight the most important parts and accent our advantages,” Bereziy, a robotics expert who graduated from Moscow State University’s mechanics and mathematics faculty, told sk.ru. ExoAtlet aims to manufacture exoskeletons – external frames that support body movements – for military and medical purposes. While the idea of an exoskeleton is nothing new – models in the West are already being used in industry and soon in defense – ExoAtlet’s versions stand out for their greater maneuverability, brain-to-computer interface and comfort, Bereziy said. “A person can stand up from a sitting position and walk along an even surface, and climb steps” with existing exoskeletons, she said. “But there are lots of limitations. In particular, if a person walking along an even surface with an exoskeleton meets an obstacle – even a short doorstep – it’s not easy to get over it,” she said. “To step over it, you need to line yourself up and calculate if the length of your stride is enough. You can’t regulate it, just as with the height of the leg lift,” Bereziy added. 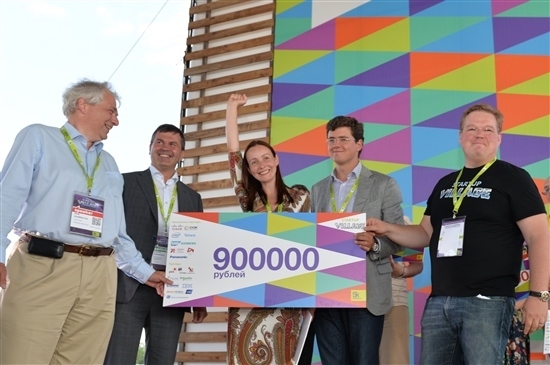 ExoAtlet was victorious at the Skolkovo Startup Village in June, winning a 900,000 ruble ($25,000) grant after holding off competition from at least 750 other startups. Bereziy noted that ExoAtlet will be seeking its first grant as a Skolkovo participant very soon in order to kick-start trials. To expedite the process the team is seeking more cost-effective materials to refine the prototype. Meanwhile, ExoAtlet’s involvement with Skolkovo appears to be paying off already: the company is switching to a more efficient power source proposed by a company from the Energy cluster. ExoAtlet is the first company in Russia to deal with exoskeletons and is in the process of patent application for its technology. 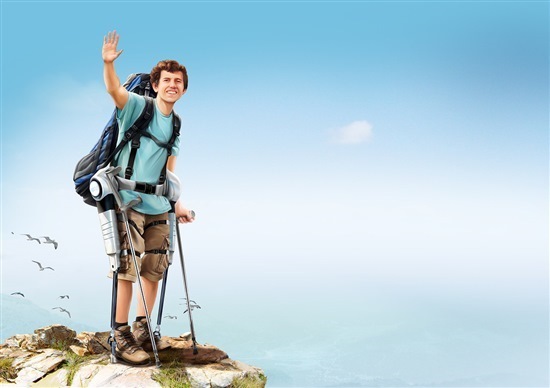 Its medical-use model, known as ExoAtlet-Med, is to support movement for people with restricted limb function and rehabilitation for lower-limb trauma victims. It is designed to help overcome paralyses caused by cerebral apoplexy or spinal cord injury. It could also benefit sufferers of cerebral palsy and similar diseases. The military version, ExoAtlet-P, is designed for search-and-rescue missions, boosting the strength and endurance of the wearer as well as supporting greater speed of movement while carrying loads in excess of 70kg. The Skolkovo Foundation is overseeing the creation of the Skolkovo Innovation Center, a 400-hectare “innovation city” site outside Moscow that includes a Technopark research hub, the Skoltech university, housing, transport, retail and entertainment facilities. Construction is due to finish in 2020, by which time many of its 1,000-plus resident companies are to have moved into the Technopark. Yefimov, meanwhile, called ExoAtlet the textbook subject for Skolkovo. “Just imagine: A guy is confined to a wheelchair his whole life. Suddenly he’s able to get up on his feet. It’s genuinely important work,” Yefimov added.